Wood Finishing Classes with Gary R. Wood - Goosebay Sawmill and Lumber, Inc.
Have you ever looked at the finish on a piece of fine furniture and said “that’s the look I want?” We will examine a variety of finishing options from a deep waxy look to a glassy smooth surface. Gary will identify the materials needed to create a special finish, and review application techniques to achieve the look you want. Bring your questions and a notepad. Applying a finish to a bowl or spindle can be a rewarding completion to your turning project. A review of surface preparation will include options for sanding and burnishing bare wood. Gary will then demonstrate the application of a variety of waxes, oils and hard coatings, including “food-safe” finishes. Questions and a sample of your work are welcome. Are you restoring woodwork in an old house, putting finish on new kitchen cabinets, or protecting a dining room table top? We will explore the options available for durable coatings, and learn how to apply finishes to large surfaces by hand without creating lap marks. 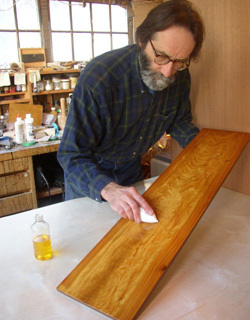 Gary will demonstrate easily applied oils and varnishes, including his own oil/resin finish. Bring your questions and a notepad. Each class is $35. All 3 classes for $90. Class size is limited. If you prefer not to use PayPal, please call us at 603-798-5135 or come in to sign up. Payment is due at time of registration. 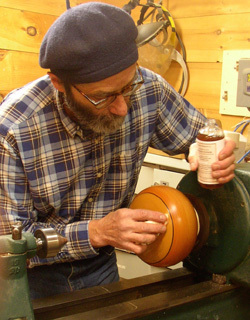 For over 40 years my shop has offered a broad range of services including custom table bases, furniture restoration, wood turning and carving, including my handturned and burnished knobs. manufacturers to meet any finishing need.